We stayed for the third year running at the Poto Skala in August of this year. 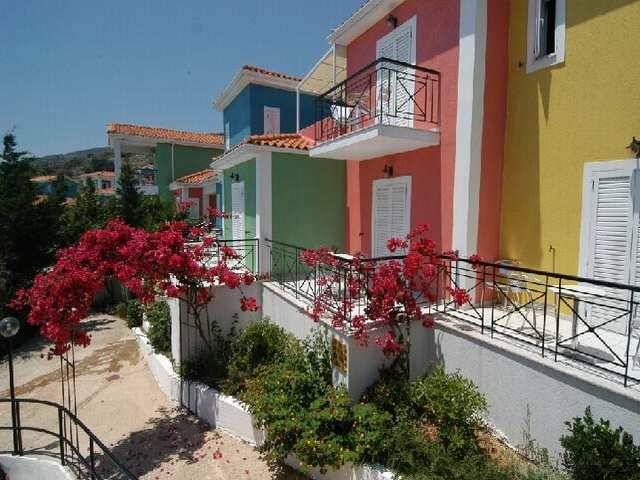 For a family with two kids it is probably one of the best places to stay in Skala. 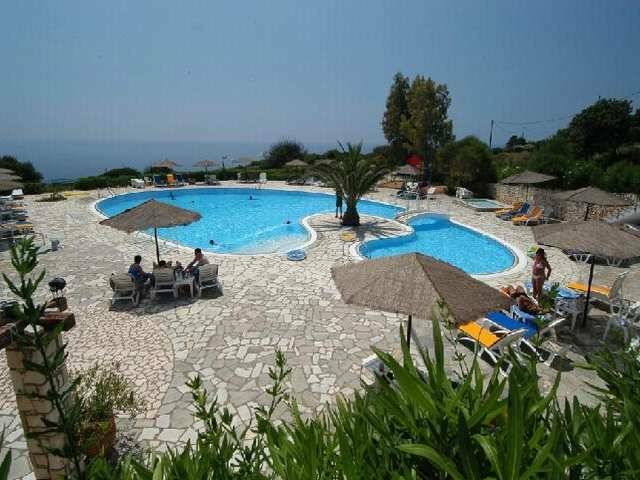 You would be hard pressed to find anywhere else with the size of pool, secure grounds at night, and some of the most pleasant staff in the whole of Kefalonia. The food is very good for the style of mass buffet catering, but don't forget they are dealing with several different nationalities, each with there own requirements for breakfast and dinner. I was pleased to see they had got rid of the Mickey Mouse Porto Skala money and had introduced a sytem of signing for everthing. Just sign and add your room number, but do check your receipts when you check out, mistakes do happen. All of the staff from the cleaners to Stavros the manager are incredibly pleasant and I would like to feel we have made some long term friends over the years (Ivan, Sandy, see you soon). Just come back from 2 weeks at the Porto Scala Hotel - had a fab time. Staff really friendly, couldn't do enough for you. Rooms were really nice and were cleaned every day. Food was nice - though the 2nd week menu was repeated. But there was always plenty to choose from. Only down side was the distance from the resort - took 45 mins to walk to the centre of Scala. Taxi's were cheap 4 euros each way but you have to tolerate the somewhat abrupt drivers complaining of you banging the doors to hard! Also need to allow extra time when getting a taxi back in the afternoon as there are very few taxis working after 1pm. You can wait up to an hour for a taxi to turn up at the rank. hotel was ok, food was a bit same every other night but it was edable & it filled us up. staff were generally friendly. rooms were nice bathrooms were good standard, nice balcony. beds were very comfy slept well every night. 40 mins walk from main town. get a cab 4 euros. but! if you go for a drink into the main town of skala beware that the cabs stop at 23:30/00:00 so dont stay out to late like we did and had to walk back in the pitch black!!!! naerly fell down a hole or 2, and it took about an hour in the dark, honestly it was a nightmare! another main thing with this hotel is that you cant use real currency! whats happens is when you get there you have to change euros into a sort of monopoly money called porto scala money. its a nightmare at first but it isnt that difficult to work out. i will say that i dont understand why thay use this way of paying for things, but i will add that i will not go back to this hotel because of this, so they are losing customers by promoting this way of paying for things. bar was abit poor as well, no atmosphere and badly stocked. entertainment was poor as well. still kephelonia is a nice island so you only really use your hotel as a base and go exploring there is so much to see you could stay for a month! 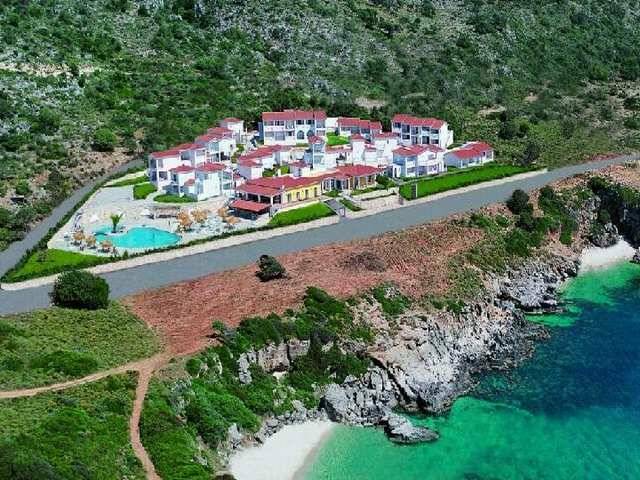 My wife and I spent our honeymoon at porto skala in July 2003. The room was basic but clean and comfortable, the staff were very friendly. The food was of good quality but very similar most nights with not much variety, so we ate out in Skala on our second week. By far the highlight of the hotel is the setting. Situated next to sea, the view is stunning, and the pool area was so peaceful all day long, with a sunbed available every time we arrived. This hotel is a favorite with Greek families from the mainland, rather than bloody Germans! so we had a quiet, stress free fortnight. Excellent hotel,restaurant has views looking over to Zante, food plenty of choice, kids enjoyed it to(9 and 3 year old). Staff are really friendly and make a fuss of all the children. Room had fridge, sea view and a/c, cleaned daily. Kids loved the pool area, plenty of sunbeds. Entertainment 3 nights per week, quiet hotel, but enough to do - great. The hotel cove, good for snorkelling if you dare cross the bridge! You do need a car. We went in June 2003 (hotest for 40 years). Stayed at Porto Skala in August this year. Hotel is excellent. Good food, good service and very clean. We loved the pool area and didn't even have to get up at 6am to put the towels out - no-one bothered with that!! 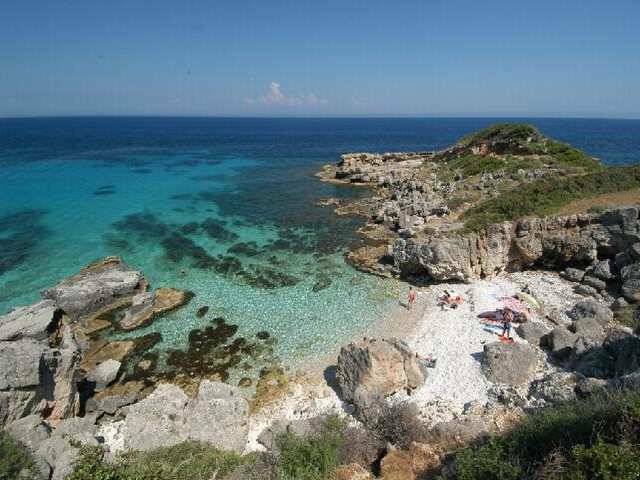 There is a lovely little cove just over the road from the Hotel great for snorkelling, take some bread and watch all the fish. Only down side is the distance from Skala - it is a good 40 minute walk into town which in August was a bit hot!! We used to walk in and get a taxi back which cost 3 Euros. Would recommend this hotel to anyone wanting a peaceful holiday on a beautiful island. We've just returned from two glorious weeks at the Porto Skala Hotel. Place was very clean, staff were more than helpful, food was very good. Although some might think it's location is a bit far out (2.5/3 km from Skala centre) it was never a great problem. My four year old daughter cried when she had to leave Vladi the Barman, and I cried when I had to say goodbye to Stella (sorry Boris). On the whole an excellent place to stay in Skala - one downside, the general prices in the bars and restaurants had increased quite a bit this year, but that's the Euro for you. We first stayed at Porto Skala in 1999. We returned last year 2002 and are going back again this year! 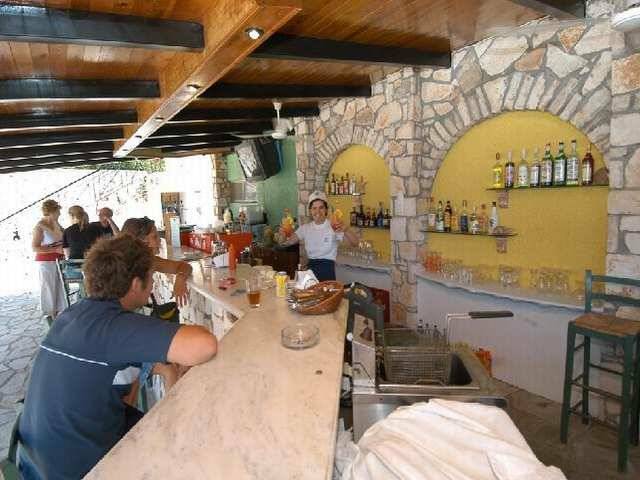 The atmosphere is very personal and nothing seems too much trouble to Stavros and the staff. The walk from Skala to the old Village is well worth the trek for the history and scenery that is the spirit of Cephalonia. 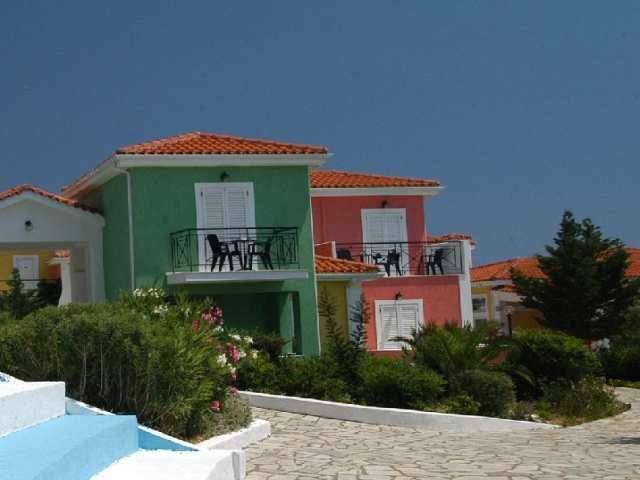 September 2002 - The Porto Skala Hotel is built in the style of a traditional Greek village with all rooms having a fridge, a/c and with a balcony looking out to sea - fantastic views. The staff were very friendly and the hotel food excellent. Located 3k out of Skala village but we enjoyed the walk in order to work off all the food! Well worth a visit. This is an excellent hotel in a beautiful location. A bit out of the way from Skala village but this adds to it's charm. The food is very good and I the staff are helpful and friendly. Went to porto scarla in 2000 loved it so much we are going back this year to get married and are staying there again.The location is a little way out of the main town of skala but the views across the sea whilst you eat evening dinner make up for the distance.The staff are very friendly and helpful, they are very accomadating with our wedding plans! Food is plentyful as breakfast and evening meal are buffet style and there is something for all.Pool area is clean and sunbeds available. Entertainment is only a couple of times a week so if you don't wish to join in there is another bar away from the area. A great hotel with good access to a wonderful island which is waiting to be explored.